How two groups at opposite ends of the spectrum can help unify a torn country. It’s a rarely quite Thursday night on the streets of downtown Cairo. Mohammed Mahmoud Street, constantly ridden with violence, has been barricaded off from each side and left completely abandoned save for a few pedestrians on foot, carrying trays of finger food and dessert. As they all turn into a small side street, past the coffeehouse chain Costa Coffee, they eventually gather at a small apartment where they greet each other with warmth, laughter and a slew of inside jokes. Although it may appear like a casual gathering of family or friends, this is the regular meeting of the revolutionary movement group ‘Salafyo Costa’ or Costa’s Salafis. “We started this movement in order to accept the other, if we can’t apply it here then it can’t be applied on the streets,” says Ahmad Nabil El-Mougy, a dentist by day and a member of the group. 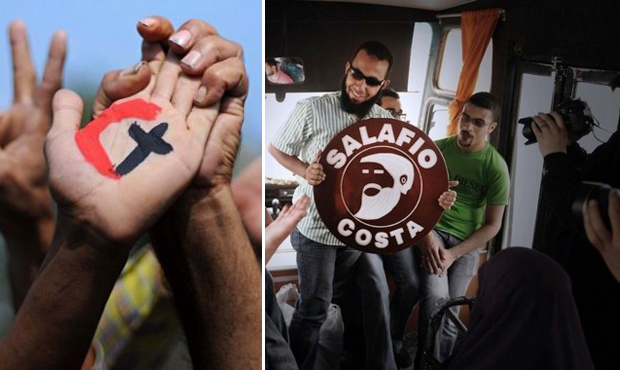 Founded in April of 2011, Salafyo Costa came to be known to the public through the images of bearded men in Tahrir Square carrying a banner of the Costa Coffee shop logo with a picture of a man with a beard rather than the coffee beans displayed in the center. With all the controversy surrounding those belonging to the Salafi belief in Egypt, who along with the Muslim Brotherhood gained a majority in the parliamentary elections held in 2011 and continue to dominate Egypt’s political scene, Salafyo Costa served as a refreshing, and humorous, take on a group of people who had been perceived by the rest of the public as ultra conservative. On the other side of the spectrum, and in another coffee shop chain, ‘Elmaneyo Cilantro’, or Cilantro Secularists, were also formed in order to change the perception of a different group in Egypt’s political life – the liberals. “We looked at the scene and found a gap, there was no group out there that represented our vision so we decided to fill that gap ourselves,” said the group in a written out reply since they refuse to conduct individual interviews. Unlike the laid back, welcoming attitude of Salafyo Costa, the Cilantro Secularists are more formal and somewhat elusive. At this point in Egypt’s political scene, and under the ruling of an Islamist president, the two groups represent two sides at odds with each other. On the one hand, the Islamist side is in power but remains heavily criticized by the other factions, while the liberal side can’t seem to get the majority on its side with a less striking message to spread. “In our opinion, we are representing a simple and accurate understanding of secularism for people who may not have had the chance to look over its principles and thought, or for those who may have gotten the wrong, perhaps distorted, idea about secularism,” says the Cilantro Secularists. The Costa Salafis are also trying to show another perspective of the country’s Salafis, albeit through a different method. According to the group, only 35% of the members are Salafis while 25% are Christians and the rest are a mixture of liberals, secularists and Ikhwanis. Which is precisely why Mariam Shalaby decided to join Salafyo Costa a year ago. “When I was growing up in a conservative family, we weren’t allowed to talk to Christians or people showing their hair then I found this group that houses all these different people who cooperate together in community work that benefits everyone,” she says. At the same time, Shalaby was allowed to preserve her identity as a Muslim within the group. “But it doesn’t let anyone give up their own identity, no one has to try to be a little more liberal to be able to talk to someone,” says Shalaby. And that also applies to opinions on politics. Even though Salafyo Costa recognizes itself as a revolutionary group, it still houses members with different opinions on politics and doesn’t have one political direction. “Our personal opinions do not reflect the opinions of the group as a whole,” says Ibrahim Shahin, a long time member of Salafyo Costa. Shahin says that the group is more concerned with spreading awareness, and dispensing correct and accurate information. For example, during the time of the voting on the constitutional referendum in December of 2012, Salafyo Costa made an educational film called, ‘Dostour ya’sta’, specifically targeted at people who may not have access to information. However, the film did not dictate whether to vote with a ‘yes’, or a ‘no’ but simply to educate the people about the content of the constitution. As for Elmaneyo Cilantro, while the 13 person team may each belong to a different political party or group, they all agree on the general idea of secularism. Another idea that they are trying to correct is that secularism is often falsely mistaken for being a religion or a replacement of religion. With all its many different ideologies, Egypt still seems to be divided, even within the groups themselves.